20 74550-2689 - 7/16 Round/axle Bushing (black). 14 74540-4419 - Battery Retainer. 38 73233-2279 - Taillight Lens Set. 41 0801-0224 - 8 X 1inch Screw. 10 0801-0220 - 10 X 1inch Screw. 8 H4433-9569 - Hoodlatch. Bbb - White. 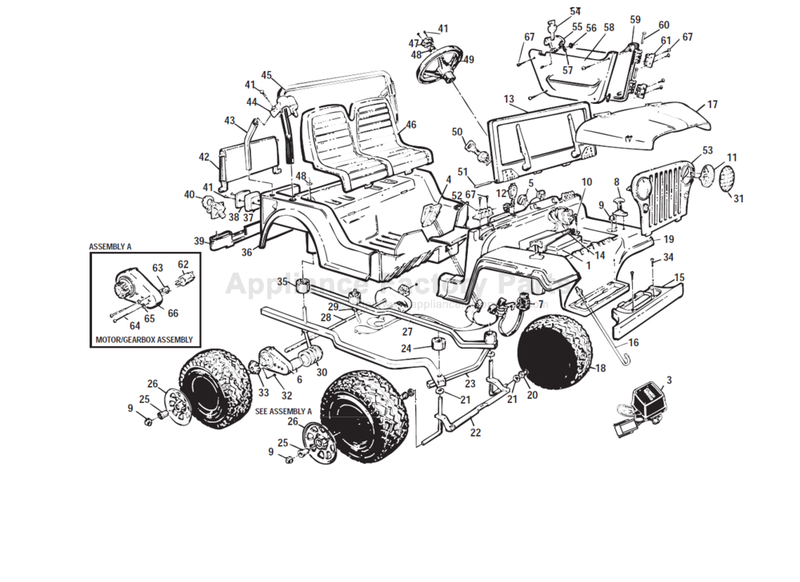 23 76817-4159 - Front Bumper Support. 50 73233-2439 - Key Assembly. 22 76817-4229 - Steering Linkage . 24 73233-2539 - Front Post Bushing . 28 76817-4559 - Rear Axle Asmbly . 35 73233-2549 - Rear Bushing . 80018-0096 - Door Assembly, Left N/a. 48 0801-0604 - .354 Black Retainer/cap Nut.